This Enervex RS12 Chimney Fan solves the worst draft problems by creating its own draft. The Enervex Fan is maintenance free, has a 10-year warranty against corrosion, and has a 2-year overall warranty against defects in materials and workmanship. 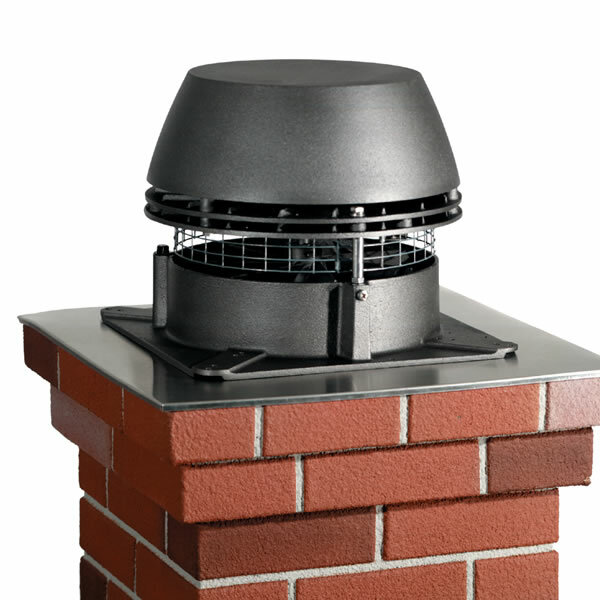 If you have major draft problems that can't be solved any other way, the Enervex RS12 Chimney Fan is the product you need.Please Note*Some local codes may prohibit the use of chimney fans on gas and oil furnaces. Installation should be performed using the services of a professional electrician, as well. What is the CFM for this fan? This operates at up to 950 CFM. For anyone that is looking for a product that is capable of solving draft problems, this cap is a solution that I would recommend wholeheartedly. Almost instantly, this product managed to successfully solve all of the draft problems that I found myself experiencing with my chimney. One other side note is that the customer service is outstanding. I got excellent help from a knowledgeable professional. I am quite happy with the quality to be found with this fan. All of the controls are extremely easy to use, and the entire unit is really quite easy to install. There is one design flaw that this product possesses, and that is there is not sufficient support on the fiber board to keep everything properly secure. This problem aside, the fan works well and runs very quietly. I am very happy all around with this product. I expect to buy these in the future if needed.